- The weather forecast for Wednesday morning was perfect to be above treeline, mid to high 50's above 5,000 feet, with a steady and refreshing breeze. I took advantage of the optimal weather to run a Presidential Range Traverse. - I started at 5:25AM from Appalachia and headed up Valley Way setting an aggressive pace over the first two miles before throttling down for the final two mile push up to Mount Madison, reaching the top in 1 hour 25 minutes. From the top, I zoomed back down to Madison Spring Hut for a five minute break to refill on water and refuel before moving on. - Conditions above treeline couldn't have been any better, the boulder field that makes up the northern Presidential Range was easy to maneuver since the rocks were dry and grippy, and it was not hard to maintain the pace I wanted to from Madison through Washington. 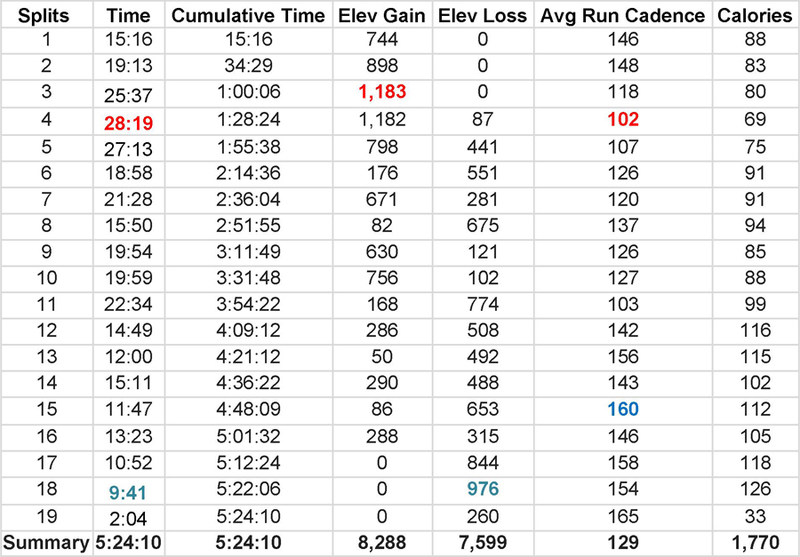 - My strategy for this section was to "run" the flats and downs, and by run I mean jog, there's only a small handful of trail runners I know that can aggressively run through this stretch. As far as the ups went I would quick hike them, but not overdo it as I wanted to save my strength for the Southern Presidential Range. - I almost had the whole summit to myself, I took a quick picture of the summit sign and headed into the cafeteria for a quick ten minute break to refill my water, prepare my gear for the second part of the hike, and to chug a Powerade that I bought, along with a Snickers bar for a much needed taste change from the gels and energy waffles I had been consuming over the first ten miles. - Now it was time to run the Southern Presidential Range, basically it's all downhill with three very short and easy ups, Mount Monroe, Eisenhower, and Pierce. I got back on trail 3 hours and 45 minutes into the run and I had saved my energy for this section, I set my sights on a sub 5 hour and 30 minute finish. 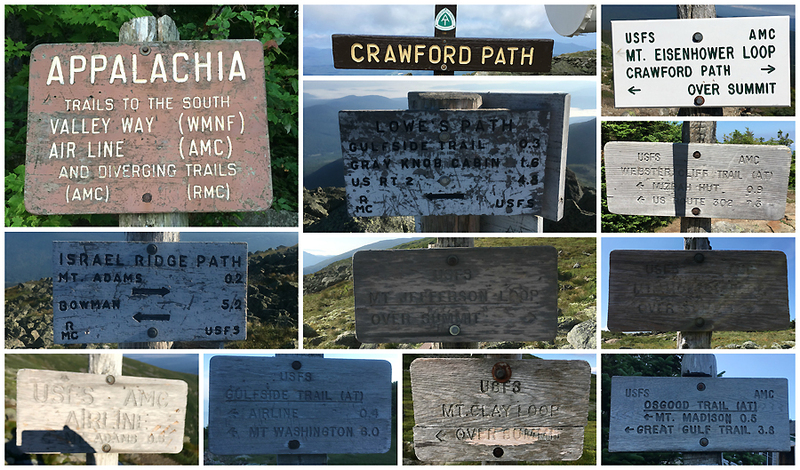 - (1) The drop down to Lakes of the Clouds and up to Mount Monroe, via Crawford Path and Mount Monroe Loop. The 1.5 mile descent to Lakes of the clouds is down a rock staircase with meticulously placed boulders making for a sidewalk type of footing compared to the northern section. From Lakes of the Clouds is a short steep up to the summit of Mount Monroe. I reached Mount Monroe 4 hours 11 minutes after starting. 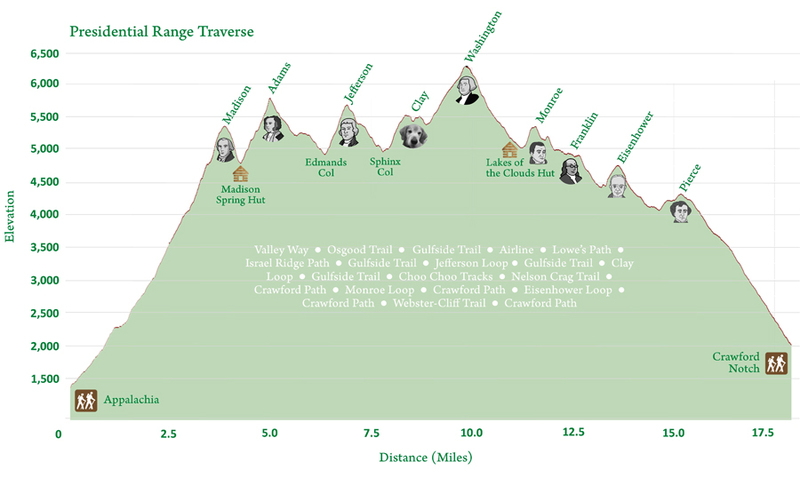 - (3) Ike to Pierce via Crawford Path and Webster-Cliff Trail. Child's play compared to the rest of the run, easy drop off of Eisenhower and and easy up to the summit of Pierce. I reach Mount Pierce 4 hours 57 minutes after I started. - (4) Descent to the Highland Center via Crawford Path. This trail is heavily used, so it keeps getting more eroded as years pass by, but the A.M.C. trail crews have been out the past two years working on slowing this erosion down, building rock steps and water bars, and it's helping, as there is definitely less standing and running water over the lower half of the trail. I had recently ran this section as part of my RUN NH48 project so I knew what I was in for. I finished 5 hours 24 minutes after I started, feeling really strong and fresh, much different than last weeks Pemi Loop run where I was exhausted, of course there is no cafeteria in the middle of a Pemi Loop! - Back at the Jeep I changed into dry clothes, relaxed, ate some real food, and headed home, not a bad way to spend the morning. Just past Thunderstorm Junction is a stretch of the Gulfside that is what the Presidential Range is all about...rocks, lots and lots of rocks! Monticello Lawn, a beautiful spot! If you get up here early enough you have the summit to yourself! Splits. My watch recorded 18.2 miles, the A.M.C. White Mountain Online Guide recorded 20 miles!